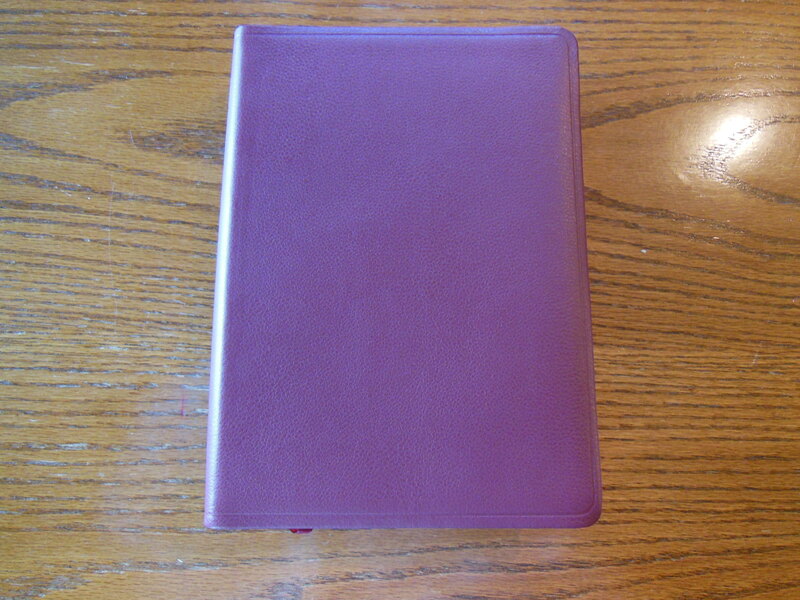 A Review of the NASB Giant Print Reference Bible, in Genuine Leather, Burgundy. Hello, 14 point font! This is definitely what the Doctor ordered if your eyes aren’t what they used to be. 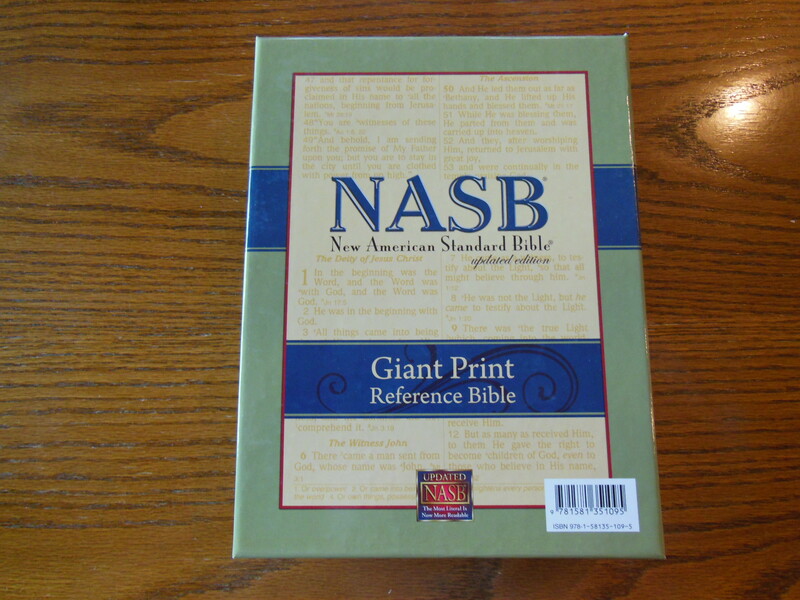 The giant print NASB was delivered to my house, as usual from Lockman Foundation’s sales branch, www.americanbiblesales.com it was packed in a cardboard box with paper as packaging material. It was sufficiently safe from harm. Inside the box was a two piece retail box. I would suggest holding onto it for storage. Once opened, I was presented with a layer of plastic wrapping that had to be defeated before I could get this beauty out to examine it. Once the plastic was discarded, I was pleasantly greeted by the familiar smell of a nice leather cover. 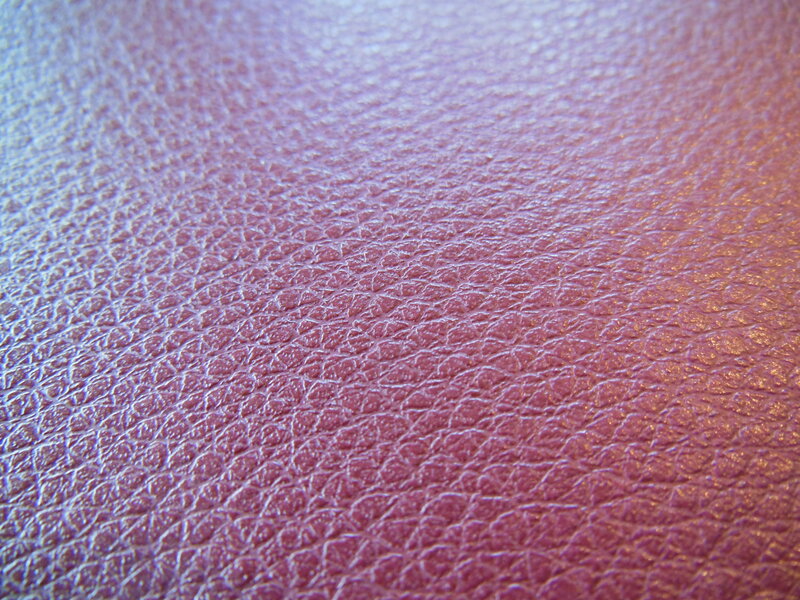 There are numerous Bibles out there that say they have a genuine leather cover, but they look like and feel like bonded leather. They have a fake grain pressed into them and their covers look shiny. Not this big boy, the cover on this has nice texture and tactile feel to it. Honestly, for the small price of this Bible I’d expect a cheaper feeling cover. I thought the burgundy color was just right as well, not brazen, but still different than the venerable black. 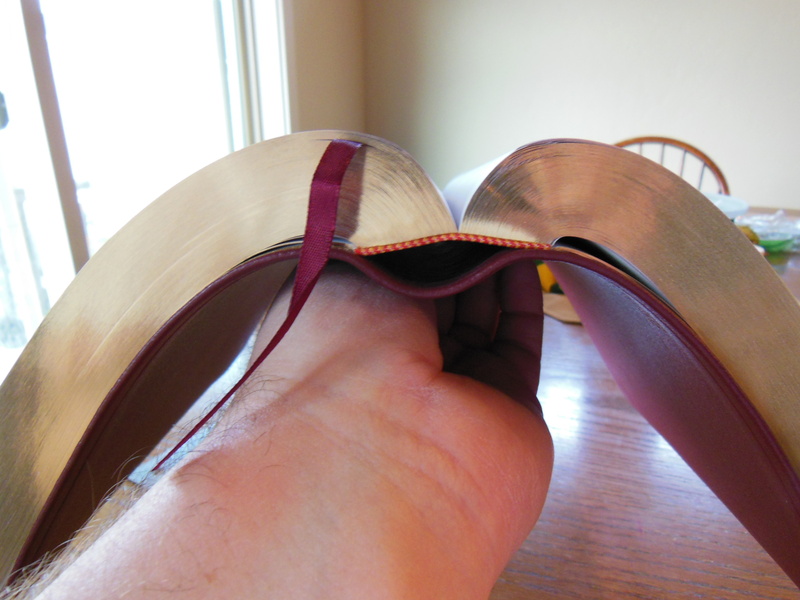 The spine of the Bible has the words, “Holy Bible” at the top. Immediately below is, “New American Standard Bible Updated Edition.” At the bottom is, “Foundation Publications” and the NASB logo. Above them are the words, “Giant Print.” There are decorative lines separating the words. 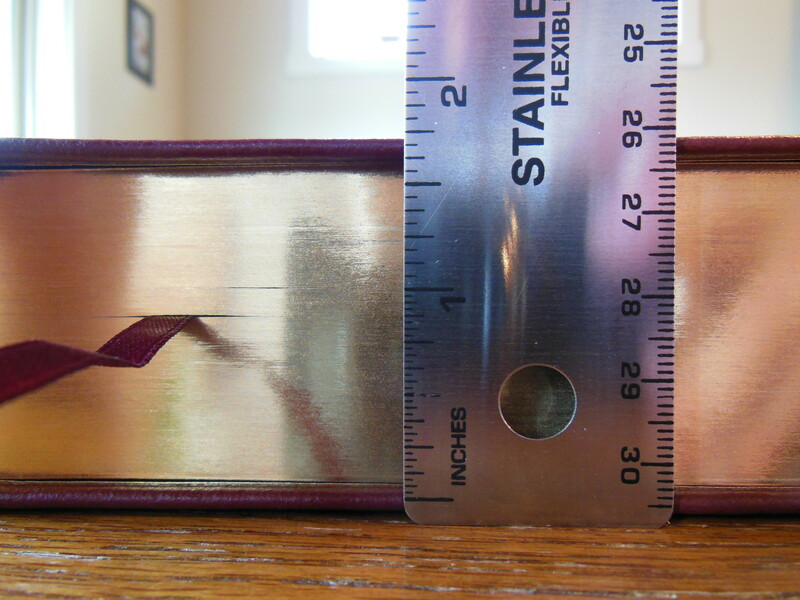 The cover has a lined pressed into it around its perimeter for decorative purposes. It adds a nice touch to finish it off. 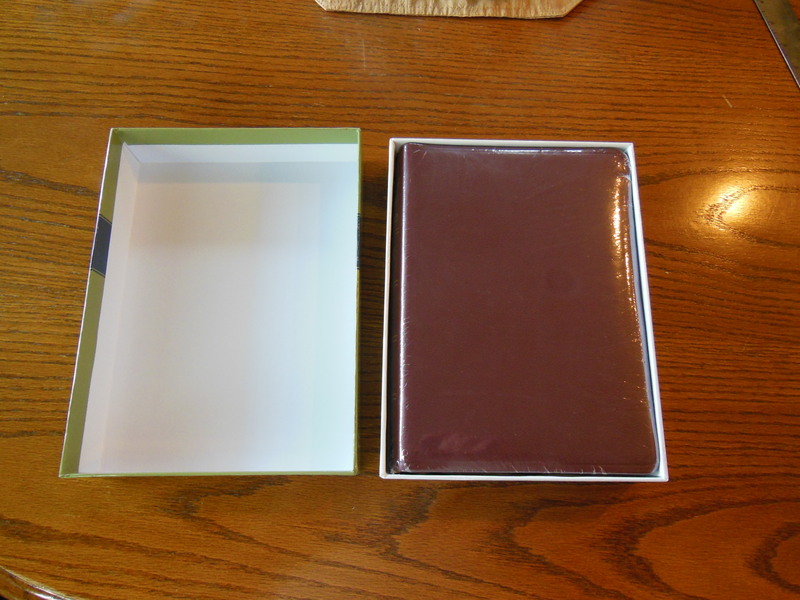 The inside cover is lined with a vinyl liner that is color matched to the cover. 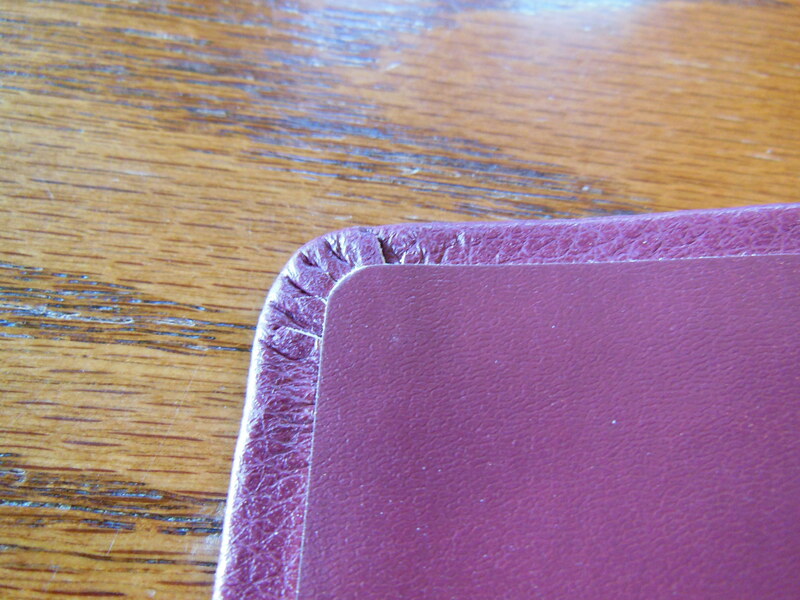 It is glued down over the corners and edges of the cover. The text block is firmly attached to the cover. I noticed no problems with fit and finish. 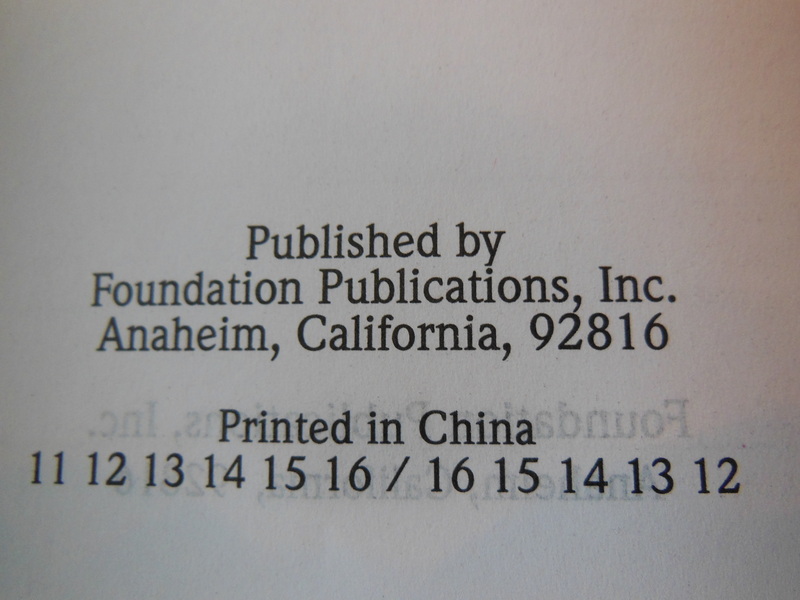 It looked pretty good for a Bible printed and bound in China. 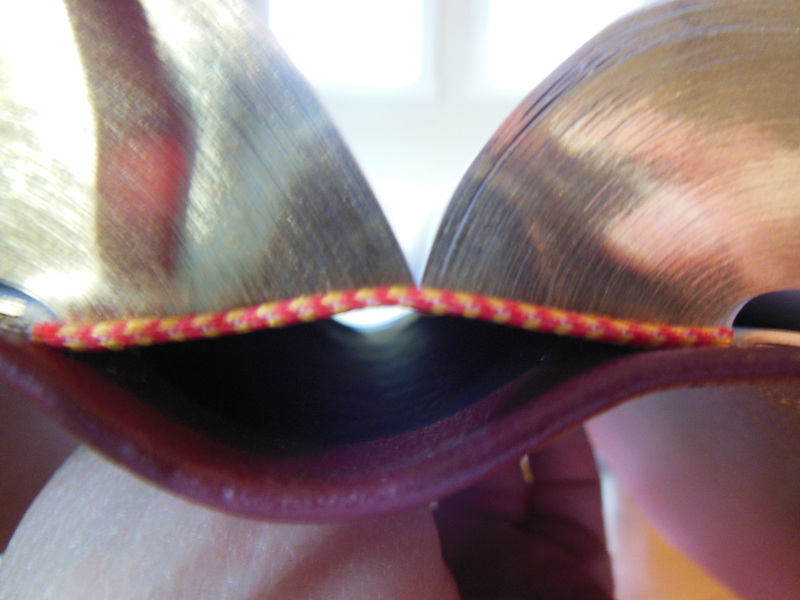 The binding for that matter is a sewn binding. It is a tad bit tighter than some of the other ones that Lockman Foundation puts out. This is neither a draw back or a benefit as far as function goes. The Giant Print edition opens flat and is pleasant to use. 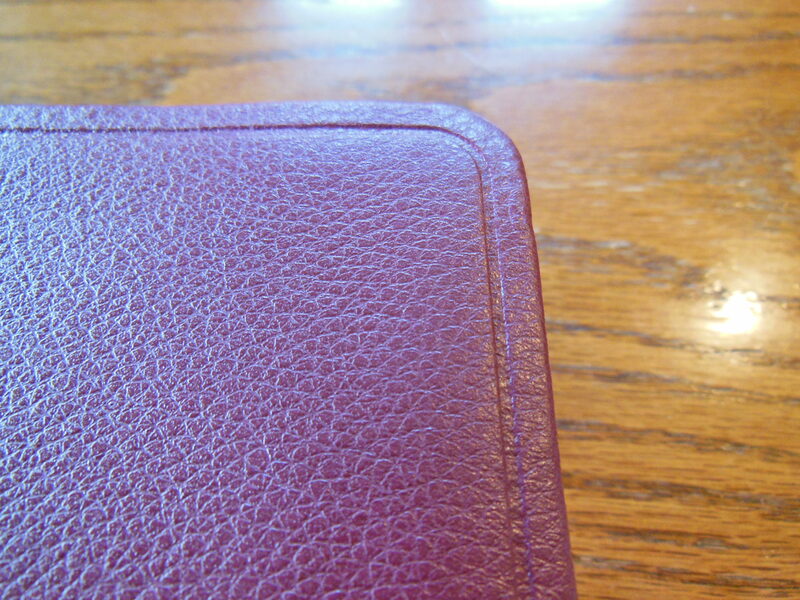 The sewn binding will help ensure years of use. 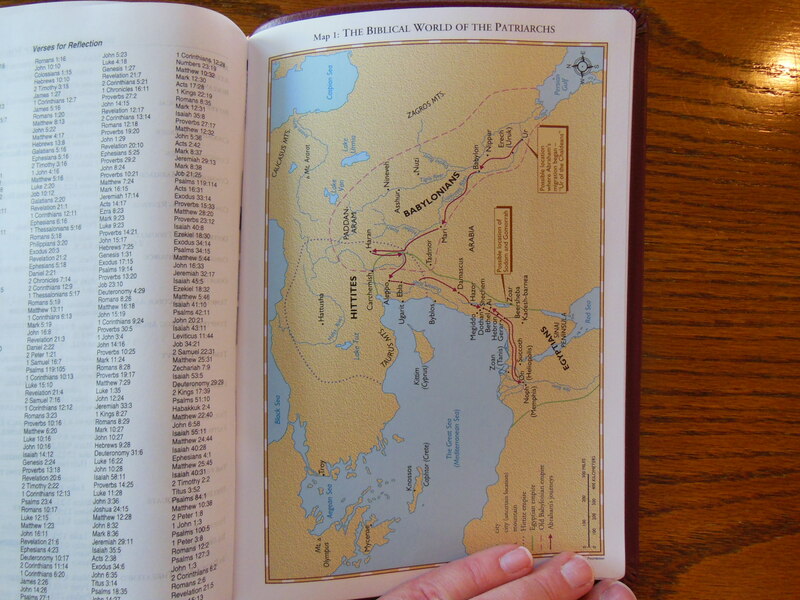 The Giant Print Bible maintains typical 6 ½” x 9 ¼” for the width and height, but is a tad bit thicker at 1 ¾” It is a little heavier than your typical reference Bible, but not by much. Even with the slight size difference it is still pretty easy to hold and read. 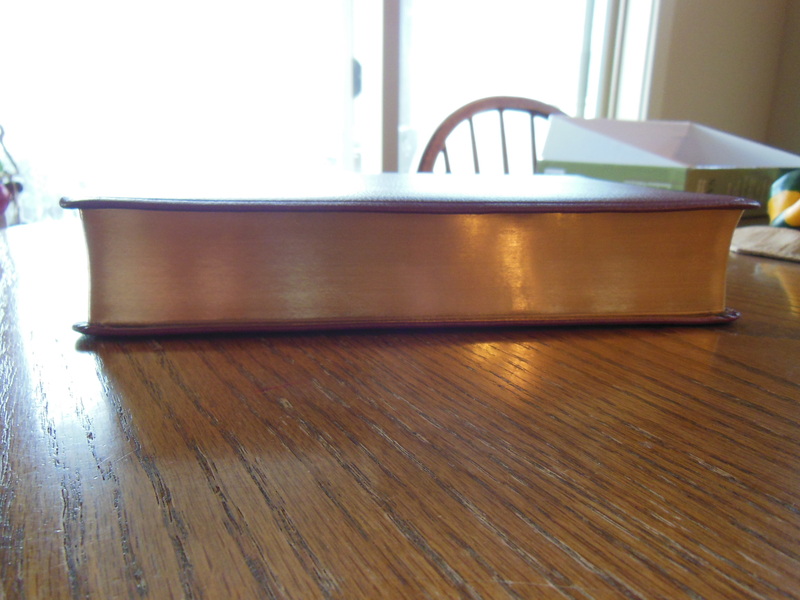 The page edges are gold gilded. The paper is a decent quality standard Bible paper 28 gsm. It doesn’t have a problem with text ghosting. I think Lockman must have realized that if you are buying a Bible with humongous font it isn’t because you have good eyesight. 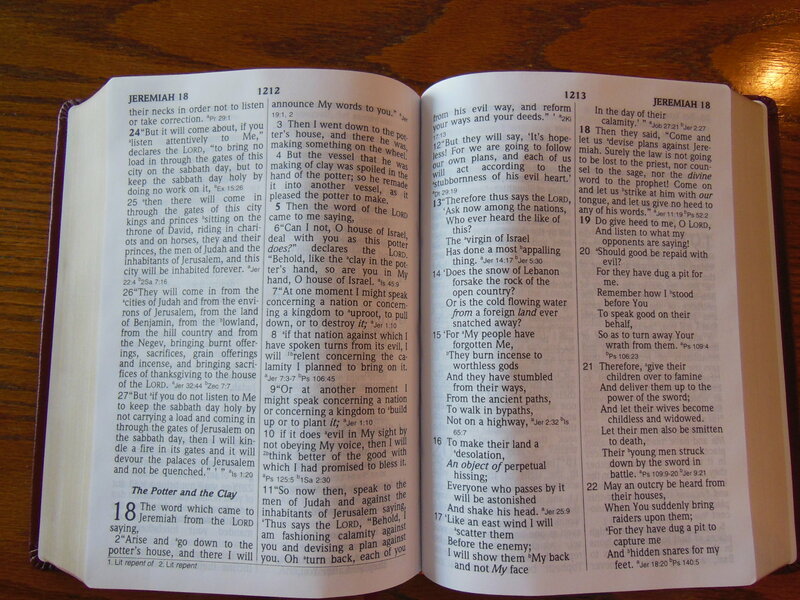 The Bible paper, 14 point font, and uniformly printed text, all aid in making this a very legible Bible without making it too cumbersome. Also you should note that this is a red letter edition. 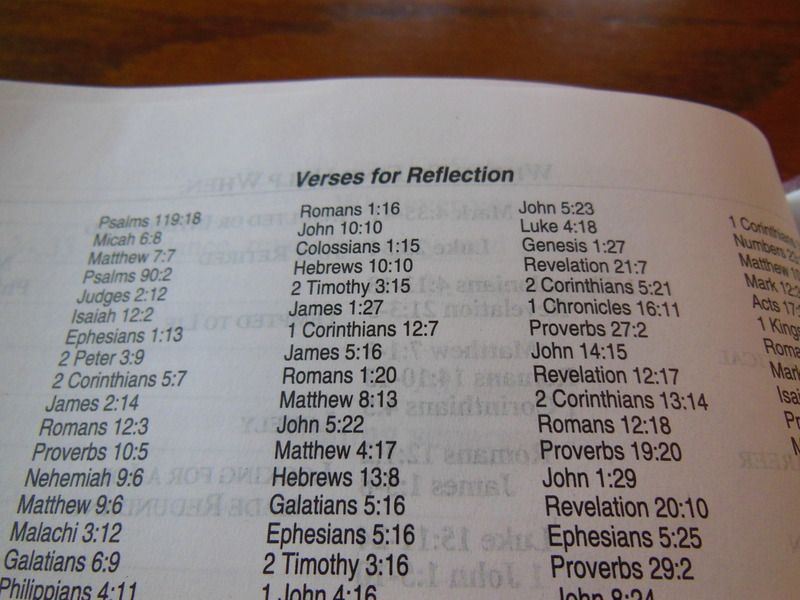 The text is in a double column verse format with references at the end of each paragraph. There are limited references, for a reference Bible. This one has about 13,000 references. I doubt that anyone considering a 14 point font giant print edition is worried about having a ton of references though. There is a ribbon marker that matches the color of the cover. It is of average quality as far as ribbon markers go. 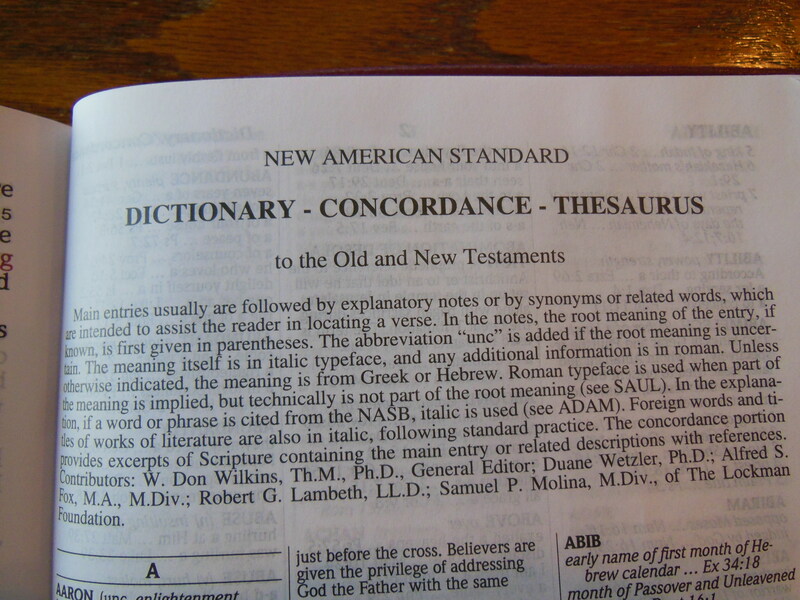 In the end there is a 146 page Dictionary/Thesaurus/Concordance. It should come in handy. There is enough there to be useful, but not so much as to unnecessarily add to the bulk. After that we have a section devoted to book introductions. 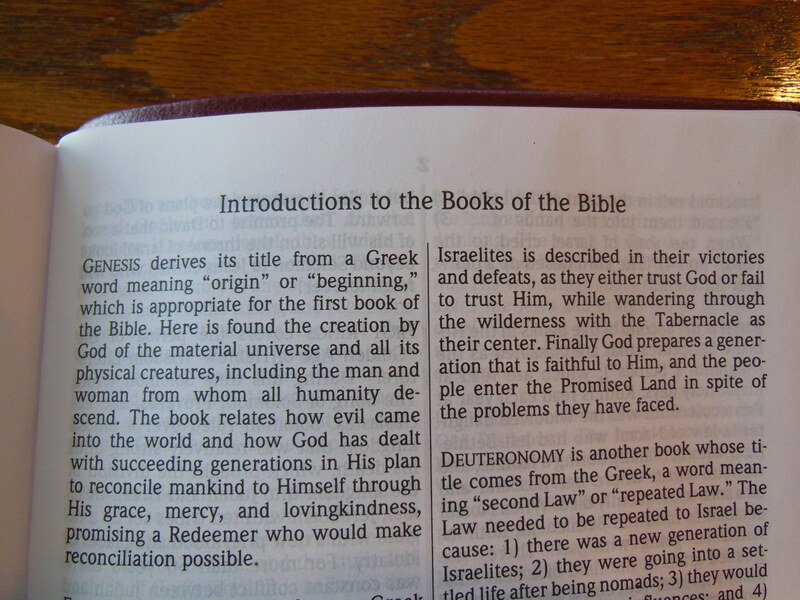 Each book in the Bible has a nice introduction to aid the reader in their studies. 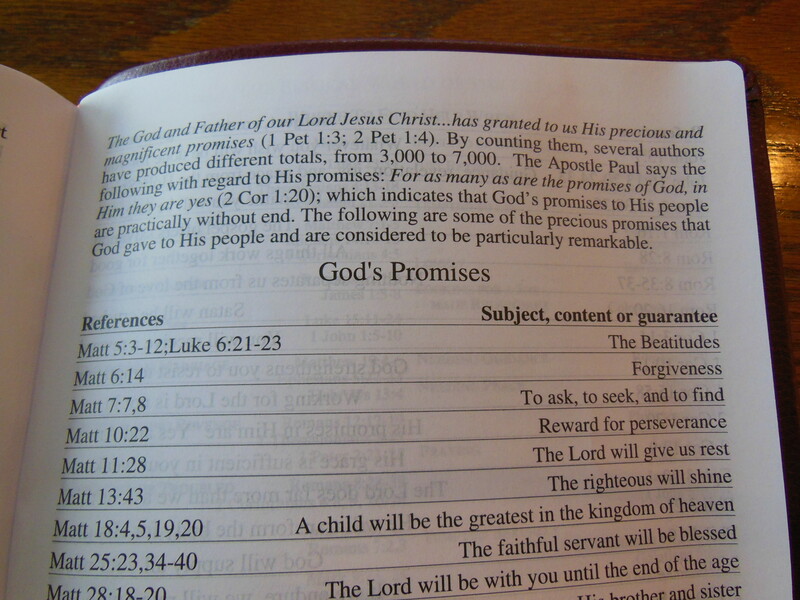 Also, a section on God’s promises is provided after the book introductions. “Where to find help when” and “Verses for reflection” appear at the very end before the color maps. I think the biggest cons here would be the size of the Bible. For the very frail and elderly this would have to rest on a table for them to read it. 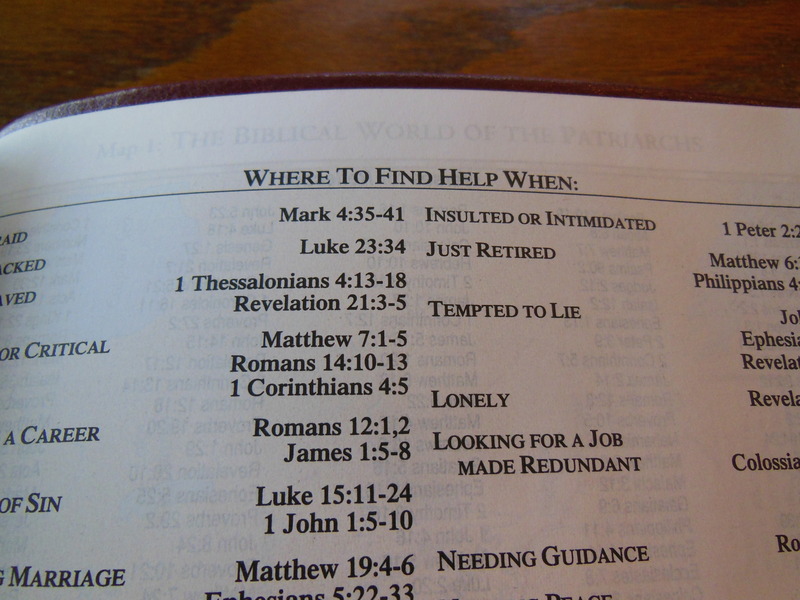 However, most elderly people won’t have any trouble holding this Bible to read. The con is a very slight one. We all have to obey physics here. If you want giant text you have to sacrifice something. I don’t think I’ve seen a better job on a giant print edition to date. The pros here are of course the 14 point font and the wonderful cover at a very reasonable price. Could hardly believe I was holding a $50 Bible. It could have been twice that. A noteworthy thing is that the presentation and records pages in the front seem to be a flat paper as opposed to the glossy paper they have been made out of. I hope that Lockman carries this over to the maps as well. This flat paper doesn’t crack or tear as easy as the glossy paper they have been made of in the past. 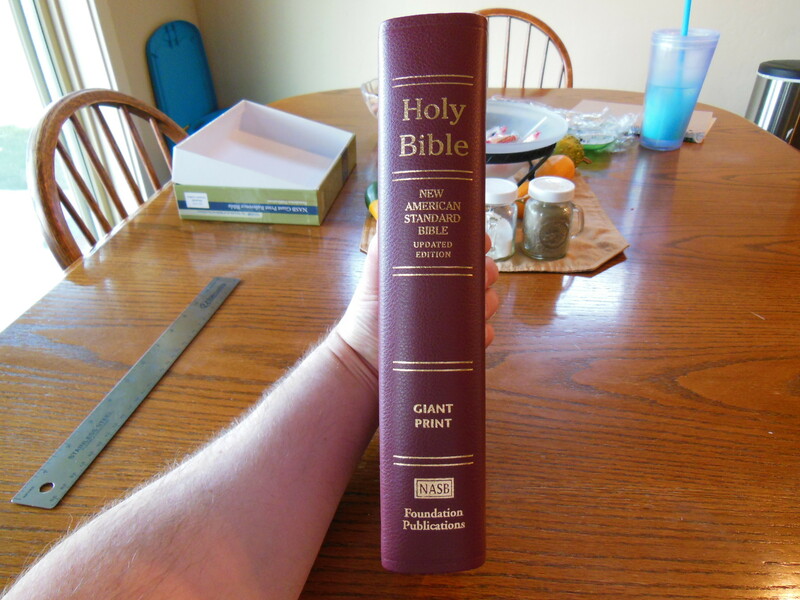 If you are in the market for one of these Giant Print Bibles they can be had for around $50. If you are lucky you might find them on sale for less. Here are a couple of links to make it easier. What Judgment Day will be like. How many of you have heard this left-wing liberal theological stance that Adam was not a man, but a he/she with the genetic info for both sexes within itself? Yeah, I know right? They call it, “The Adam” and then their story goes something like this; God made it from the dirt, thus its name, because the Hebrew word for dirt is, “’adamah” so that is why that he/she creature was called, “Adam.” Then God put it to sleep and didn’t literally make females from its rib but more figuratively created the separate genders at that point. If you are laughing like I was when I first heard this nonsense, stop! This is the garbage they are teaching in seminaries. I may not have represented their position the way they would like, but this is how I understand what they are saying. So how about all the verses talking about gender roles, authority, submission, shadows and types that depend on these concepts, and the authority of scripture? Well, no problem for the liberal theologians, they just call what they don’t like allegory and when they can’t, they say that the Bible isn’t really fully the word of God, and it can’t be fully relied on. Well, not to sound like, “The Church Lady” but who does that remind you of? Hmm? Someone with a serpent sounding hissing voice in the garden maybe? Well, I wonder who that could be? 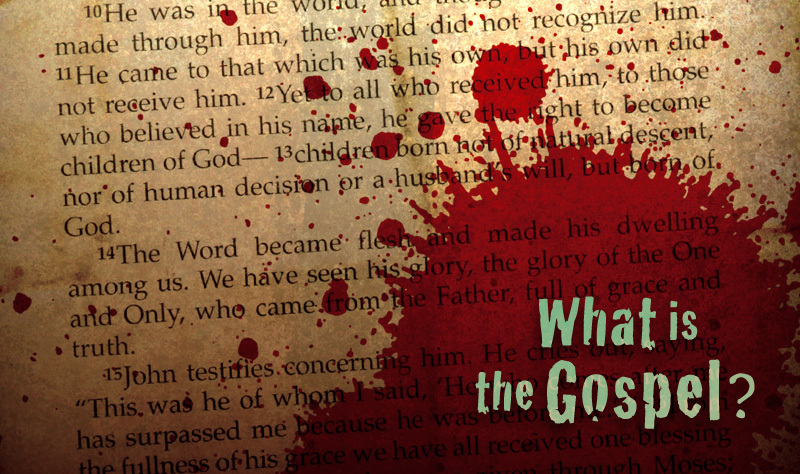 I wonder who casts doubt on God’s word? Who could it be? Does it remind you of… SATAN!!!? Surely God made Adam, the first human as a male from the start. Surely Eve was made from and for Adam as the word of God says. In 1 Corinthians 11:1-15 we can even read what God said about it as Paul restates the creation of man and woman in the New Covenant for a group of believers who were falling into egalitarianism just like we are today. They needed a correction from God then as we do now. “In Genesis 2 we have the creation account of the very first human being. In English translations of Genesis 2 this first human is simply called “man”. This “man” is understood by most people as referring to a male human rather than to a generic human. However, in the Hebrew text, the first “man” is not specifically referred to as a male human (ish) until after the “operation” mentioned in Genesis 2:21-22. After the “operation”, the now male human sees the female human and says, “This one is bone of my bone, and flesh of my flesh! She will be called ‘woman’ (ishshah) because she was taken out of ‘man’ (ish).” The first woman (ishshah) and the first man (ish) had both been a part of, or one side of, the first human being (ha’adam). In Genesis 2:23 the man indicates that they shared the same flesh and bone. The Hebrew word adam means “human being” – and not necessarily a male human being. In the early chapters of Genesis it is often used with the definite article = ha’adam (הָאָדָם) meaning “the human being” (cf Gen. 5:2). Occasionally it serves as a proper name “Adam”, usually written without the article. I have also highlighted every incidence of ish (man) with blue, and ishshah (woman) with pink. By looking at the screenshots below it is evident that it is not until the woman is taken out of the first human that we clearly see an ish, a male person, and not before. Just because what is implied by the author could be so, doesn’t mean that it is. This is an error in logic that she has made without considering the rest of scripture. Let’s take a look at the problem. She assumes that the first of mankind was a creature containing both sexes or neither and that God did an, “operation” on this creature to turn the source creature into a masculine one as it was not before and then to make a feminine one from that source creature. The scripture doesn’t support this furthermore, it definitely repudiates it in 1 Corinthians 11:1-16. Don’t take my word for it look for yourself. 1Be imitators of me, just as I also am of Christ. 2Now I praise you because you remember me in everything and hold firmly to the traditions, just as I delivered them to you. 3But I want you to understand that Christ is the head of every man, and the man is the head of a woman, and God is the head of Christ. 4Every man who has something on his head while praying or prophesying disgraces his head. 5But every woman who has her head uncovered while praying or prophesying disgraces her head, for she is one and the same as the woman whose head is shaved. 6For if a woman does not cover her head, let her also have her hair cut off; but if it is disgraceful for a woman to have her hair cut off or her head shaved, let her cover her head. 7For a man ought not to have his head covered, since he is the image and glory of God; but the woman is the glory of man. 8For man does not originate from woman, but woman from man; 9for indeed man was not created for the woman’s sake, but woman for the man’s sake. 10Therefore the woman ought to have a symbol of authority on her head, because of the angels. 11However, in the Lord, neither is woman independent of man, nor is man independent of woman. 12For as the woman originates from the man, so also the man has his birth through the woman; and all things originate from God. 13Judge for yourselves: is it proper for a woman to pray to God with her head uncovered? 14Does not even nature itself teach you that if a man has long hair, it is a dishonor to him, 15but if a woman has long hair, it is a glory to her? For her hair is given to her for a covering. 16But if one is inclined to be contentious, we have no other practice, nor have the churches of God. In v. 7 God explains that man is the image and glory of God; but woman is the glory of man. 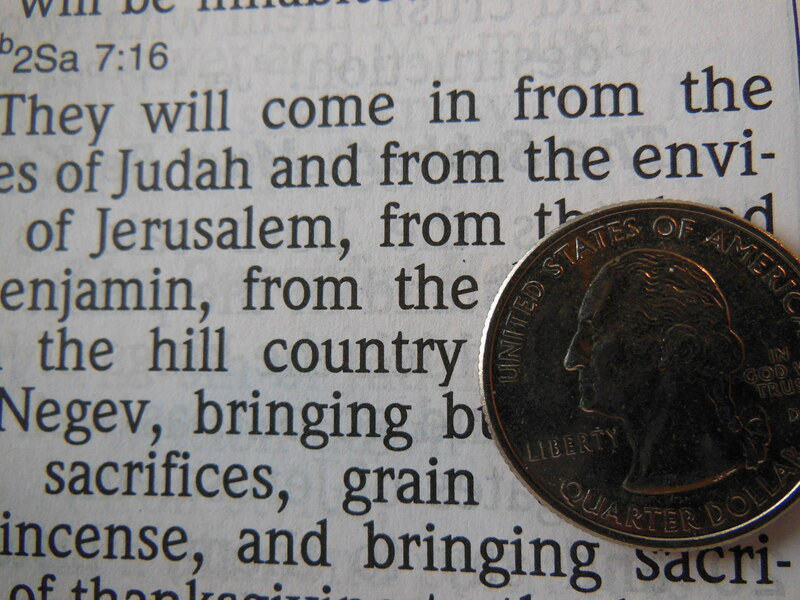 We can see the plain meaning of scripture here. Then the Greek word, “ἀνὴρ aner” is used in v. 8 it is specifically, “man.” Read how woman came from man according to God through Paul. So either God is confused or the egalitarians are willfully in rebellion against the God of scripture and their God given roles, or God is confused and doesn’t remember what He said in Genesis, or Paul was just a sexist member of the patriarchy trying to keep women down… Really people?… I mean, seriously? Just repent, accept what God says in His word and conform to His word and will. Then v.9 hammers it home, “9for indeed man was not created for the woman’s sake, but woman for the man’s sake.” It is that simple. To go a bit further so that the liberals don’t try to eisegete vv. 11-16 yes, men and women in Christ are all dependent on Him, and men are born of mothers, but the point in context is not the condition of procreation stated here, but rather God’s creation and it’s total dependency on Him. If you still want to be a whiny baby I refer you to v. 16. Basically this is how it is and if you don’t like it tough. Paul is putting it simply, “You are wrong.” Have a good day. p.s. if my tone seems a bit abrasive, that’s because I am irritated by all of the nonsense we have to entertain and argue against. It seems ludicrous to me that people would keep rehashing all of the old heresies with new labels and faces. It agitates me that people have to make apologetic answers instead of just saying, “You’re and idiot. Sit down and be quite Sir/Ma’am.” Ignorant people listen to these misguided guides and follow them into folly, so we have no choice, but to speak up. The gospel of Jesus. We are a sinners who deserve death and hell. He is God incarnate. He is righteous and holy. He deserves all of the majesty of Heaven and our praise. In His longsuffering He endures our hatred of Him and His law. 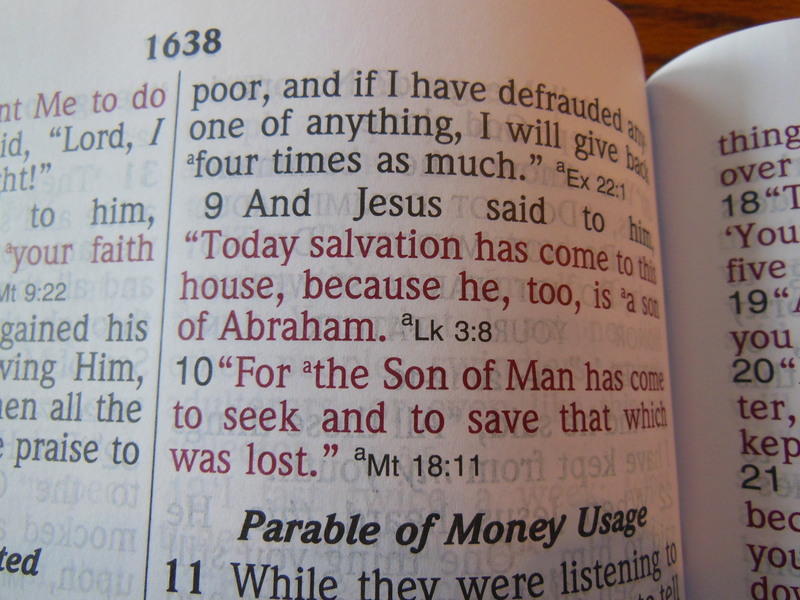 He condescends to save us from the condemnation of hell. He is raised upon a cross, thereupon crucified. He takes our punishment upon Himself, thus satisfying the justice of God. The wrath of God is assuaged by His atoning work. We hear about what He has done for us and either believe it or not. If not, then the flames of hell are waiting for us, and rightly so, for we are fully culpable for our transgressions. If we believe, then repentance is our faith revealed and testimony to the dying world. We hate our sins and turn to Christ our redeemer, who purchased us with His sacrifice upon the cross. He becomes our Lord and Master. Sin no longer rules us. 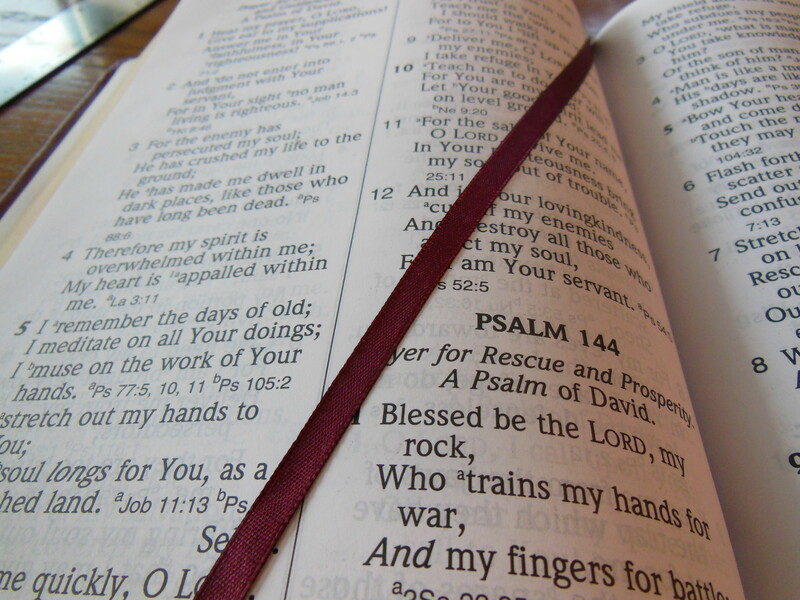 Our minds are being renewed by the reading of His word. Our hearts are transformed into new living hearts with God honoring desires. He sanctifies us as we grow in faith and knowledge of Him. We are born again. Not to live as slaves to sin and death, but to live as bondservants of Christ and holiness. Love Jesus with all of your heart, for He is the Savior! The Pastor at the SBC Church I attend gave these booklets out to everyone last Sunday after Service as an early Christmas present. It didn’t take long to read. I am a slow reader, so for me that is saying something. It was pretty concise and brief. Packed in a small booklet between two hard covers is a primer, if you will, on being in The Church and being in A Church simultaneously, instead of one or the other. 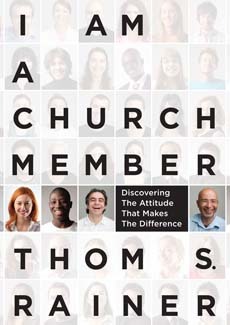 The ideas inside this book truly express the gospel, and what it means to be part of the body. I encourage all new Christians and those of us who have matured to read this booklet. For the younger folks it will help them understand what this is all about and for us a bit further along it will help us remember what we are to be about. We aren’t in a social club, even though we socialize with one another. We aren’t there for the benefits, even though we do benefit from corporate worship and ministry to the body. We are there for the love of God and the worship of Him who made us. In the abounding overflow of His love expressed to us by Christ crucified we should lavish that same love on the body as we minister to each other and share the glorious gospel of Jesus with those who have never heard. As a healthy body, made of healthy members, we can magnify Christ and glorify God, through the proclamation of His gospel, His word, and our love for one another. This book is a great reminder and primer. Some complain that this is legalistic or that the scripture verses are out of context. Some also complain about the contracts at the end of every chapter. I answer that by saying you need to look at the intent of the book. You don’t have to sign the contracts and turn them in. They aren’t binding. I think they are kind of silly myself. As an entire mission, I agree that the local Church needs to shape up, but it can’t be done by people obligatorily signing up for things. The idea within this booklet is for you to have a changed heart and then you’ll want to do the things within the booklet. The problem with the Church is that it is full of unchanged people. You can’t expect them to, “get on board” when they aren’t even on the team. So to the critics, I ask, “Are you sure you are saved?” If you are then you won’t hate the Church. Update on the Cambridge Concord and Transetto Shipping Damage. I was contacted by an employee of Cambridge Press. (I didn’t get permission to use their name or quote them so I’ll use general references.) 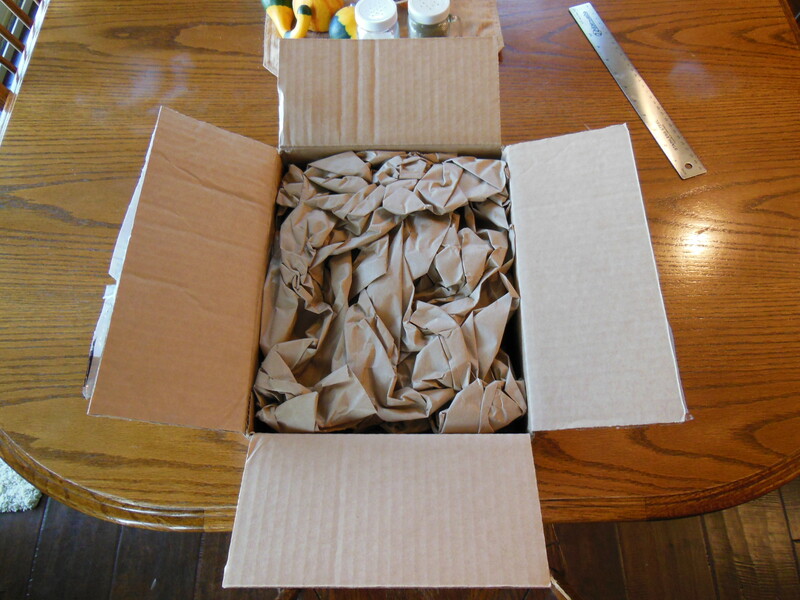 They told me they would be looking into how the two Bibles came to be packed improperly and incurred damage during shipping due to the improper packaging. I promptly received an e-mail back from my contact at Cambridge Press. They concluded during their investigation that it was indeed a training issue and have resolved the problem. I commend them on their efforts to maintain high standards. You can read about the damage here.